In the debate over climate change and the transition to a clean energy economy, there remains an elephant in the room. Many developed nations talk about ending our addiction on fossil fuels, about the need for radical cuts in carbon dioxide in order to avoid catastrophic climate change and yet, at the same time, they continue to subsidise the exploration of fossil fuels. Despite repeated pledges to end subsidising fossil fuels, governments are still spending billions doing so. Five years ago, the G20 pledged to the phase out of ‘inefficient’ fossil fuel subsidies and re-iterated the call last year in Saint Petersburg in 2013. 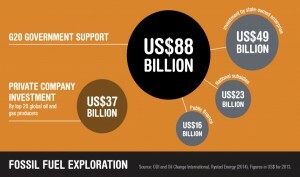 Yet a new report by the Overseas Development Institute and Oil Change International, published on the eve of this year’s G20 Leaders’ Summit, which will be held on 15 and 16 November, in Australia, has found that governments are still spending a whopping $88 billion every year supporting fossil fuel exploration. Amazingly, this is over double what the oil and gas companies themsevles are investing. In 2013, the top 20 private oil and gas companies invested just $37 billion in exploration across the globe, less than half of that being ploughed in annually by G20 governments. The madness of the situation is that the governments know that the majority of the oil and gas that is discovered needs to be kept in the ground if we are to avoid dangerous runaway climate change. Indeed, the report argues that, by providing subsidies for fossil-fuel exploration, the G20 countries are creating a ‘triple-lose’ scenario: They are directing large volumes of finance into high-carbon assets that cannot be exploited without catastrophic climate effects; whilst diverting investment from economic low-carbon alternatives such as solar, wind and hydro-power. And finally they are undermining the prospects for an ambitious climate deal in 2015. The report, entitled ‘The fossil fuel bail-out: G20 subsidies for oil, gas and coal exploration,’ is the first detailed breakdown of fossil fuel exploration subsidies by all G20 countries. It shows that with rising costs for hard-to-reach reserves, and falling coal and oil prices, generous public subsidies are propping up fossil fuel exploration which would otherwise be deemed uneconomic. The worst villain is, not surprisingly, the United States which splashed out $5.1 billion annually in subsidies for fossil fuel exploration in 2013 – ironically almost double the level in 2009 when the G20 pledged to phase out fossil fuel subsidies. Although President Obama has proposed to cut subsidies, the oil-washed Congress has failed to pass any subsidy cuts. Next up is Australia, which is providing $3.5 billion a year for the development of fossil fuel resources both onshore and offshore. President Putin’s Russia provides $2.4 billion in subsidies annually, including in the Arctic, the first region we should be disinvesting from and where the ravages of climate change are already being felt. Not to be outdone, and trying to prop up its ailing North Sea reserves, the United Kingdom gives over $1.2 billion in subsidies. Many of the companies receiving tax breaks are international companies such as Total, Statoil, Centrica and Chevron. The UK government is also subsidising fossil fuel extraction abroad, spending $663 million annually in public finance for overseas exploration including in Siberia in Russia, Brazil, India, Indonesia, Nigeria, Guinea and Ghana. Perversely you end up with a “merry-go-round” of countries supporting each others’ companies. The US subsidizes exploration in Columbia, Nigeria and Russia, while Russia is subsidising exploration in Venezuela and China, which in turn supports companies exploring Canada, Brazil and Mexico. The report also highlights US$521 million in public finance is being channelled into fossil fuel exploration by the G20 through multilateral development banks, of which the World Bank Group is responsible for two-thirds. We call for a global moratorium on fossil fuel exploration.